Garlic mustard (Alliaria petiolata) is a cool-season, invasive, herbaceous plant that is invading temperate forests throughout much of North America (Figure 1). The plant is native to Eurasia and northern Africa, and was introduced into the U.S. for food and as a medicinal plant. It is well established in the upper Midwest and eastern U.S., and is reported across the northern half of the U.S., Alaska, and parts of Canada. 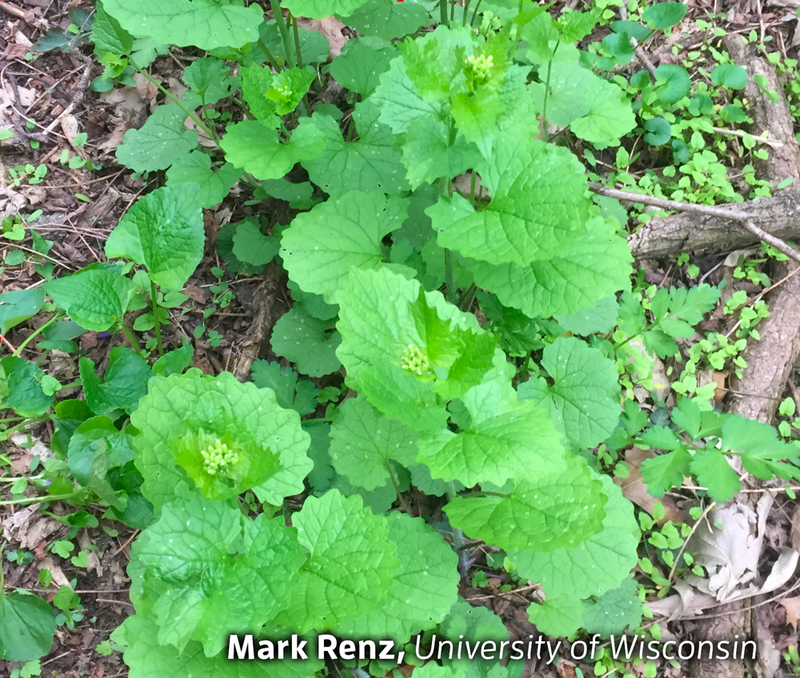 Garlic mustard is shade tolerant and can move into stable forest understory where it rapidly out-competes native vegetation. Once established, the plant is capable of forming near-monotypic stands that suppress growth and recruitment of native plants and tree seedlings. Research has shown that garlic mustard can interrupt the associations that plants form with mycorrhizal fungi. Garlic mustard is a biennial or short-lived perennial that can grow to about 3 feet in height. Seeds germinate early in spring, and new seedlings produce numerous kidney-shaped basal leaves that remain green throughout winter (Figure 2). In the second year, plants develop a vertical stem with alternative leaves that are more triangular or heart-shaped (Figure 3). All foliage produces a garlic-like odor when crushed. Stems often branch near the top and have individual flowers that alternate up the stem. Flowers have four white petals about ¼ inch long, four sepals, and six stamens. Fruits are long and linear, and individual plants can produce up to 8000 seed. FIGURE 2: Garlic mustard seedlings produce numerous round- to kidney-shaped basal leaves that remain green throughout winter. Photo by Mark Renz, University of Wisconsin. FIGURE 3: Garlic mustard stems bolt in the second growing season, and have alternative, heart-shaped leaves and white flowers. Photo by Chris Evans, University of Illinois, Bugwood.org. Garlic mustard is difficult to eradicate once plants have established and produced seed. Since the plant quickly invades disturbed sites, management efforts should strive to reduce soil and vegetation disturbance. Early detection and removal of new infestations before they produce seed will reduce the need for long-term management. If plants have produced seed, the site must be monitored and germinating seedlings removed for at least 10 years if eradication is the goal. Garlic mustard spreads from established infestations along an invasion front. Small, satellite infestations often occur along trails, roads, or forest edges by seed transport. Management priority should be given to removal of these satellite infestations. Field trials were conducted on garlic mustard to compare efficacy of Vastlan® and Garlon® 4 Ultra specialty herbicides to Accord® XRT II herbicide. Results of the study showed that both Garlon 4 Ultra and Accord XRT II provided excellent control of garlic mustard 38 days after application (Figure 4). Garlon 4 Ultra is a selective herbicide that will control garlic mustard and allow desirable grasses to thrive. Apply Garlon 4 Ultra at 16 to 32 fluid ounces of product per acre (oz/A), or as a spot application of 1.25 percent volume to volume (% v/v). Applications should be made to foliage in spring when plants are in the rosette growth stage. Use caution when applying herbicide solution near stems of desirable woody plants as injury may occur. Accord XRT II applied at 1 to 1.5% v/v provides effective control of garlic mustard seedlings and rosettes. Accord XRT II is a non-selective herbicide, which can kill or damage most plants that are contacted by the spray solution. Garlic mustard must be actively growing to absorb the herbicide. Applications of Accord XRT II in late winter and early spring can often be timed for periods when few if any other plants beside garlic mustard are actively growing. FIGURE 4: Percent control of garlic mustard 38 days following application of several herbicides. Application rates are shown as percent volume to volume (v/v). Individual garlic mustard plants can be controlled by digging. Cutting the entire taproot with a sharp shovel or spade 1 to 2 inches below the soil surface will control plants. Soil disturbance should be minimized to reduce garlic mustard reinvasion. Mowing or cutting of above-ground growth should be done as low as possible to reduce flowering and seed production. If garlic mustard is flowering, it is important to remove all cut stems since viable seed may be produced even if the stem is severed from the root. Because mechanical cutting does not remove the root crown, it may be necessary to cut multiple times in a growing season to prevent seeds from developing on secondary stems that sprout from the rootstock. Mowing may impact desirable non-target vegetation. The effectiveness of fire as a control tool for garlic mustard differs based on site characteristics. Research shows that dormant-season fires do not control garlic mustard; however, fires conducted after garlic mustard emergences but prior to emergence of desirable plants may be effective. Repeated burns (fall, spring, spring; or spring, spring, spring), have been used to maintain garlic mustard in a reduced condition and stimulate herbaceous species richness and cover. Integrating herbicide treatments with fire may be more effective than fire alone. Research is underway to develop biological control of garlic mustard. Currently, six species are identified as possible candidates for biological control agents. Future biological controls will be an essential component of integrated management of garlic mustard. Blossey, B., V. Nuzzo, H. Hinz, E. Gerber. 2001. Developing biological control of Alliaria petiolata (M.Bieb.) Cavara and Grande (Garlic mustard). Natural Areas Journal 21: 357-367. DiTomaso, JM, GB Kyser et al. 2013. Weed Control in Natural Areas in the Western United States. Weed Research and Information Center, Univ. of CA. 544pp. Dow AgroSciences, Unpublished field data. EDDMapS. 2018. Early Detection & Distribution Mapping System. The University of Georgia — Center for Invasive Species and Ecosystem Health. Online: www.eddmaps.org/; last accessed February 1, 2018. Nuzzo, V.A. 1991. Experimental control of garlic mustard [Alliaria petiolata (Bieb.) Cavara and Grande] in northern Illinois using fire, herbicide and cutting. Natural Areas Journal. 11: 158-167. Nuzzo, V.A., 1996. Impact of dormant season herbicide treatment on the alien herb garlic mustard (Alliaria petiolata (M.Bieb.) Cavara and Grande) and groundlayer vegetation. Transactions of the Illinois State Academy of Science. 89: 25-36. Nuzzo, V.A., W. McClain, and T. Strole. 1996. Fire impact on groundlayer flora in a sand forest. The American Midland Naturalist. 136: 207-221. Pardidi, EA, JM Drake, JM Chase, and TM Knight. 2009. Complex population dynamics and control of the invasive biennial Alliaria petiolata (garlic mustard). Ecological Applications.19:2. pp387-397. USDA, NRCS. 2018. The PLANTS Database (plants.usda.gov, 1 February 2018). National Plant Data Team, Greensboro, NC 27401-4901 USA. ®™Trademark of The Dow Chemical Company (“Dow”) or an affiliated company of Dow. State restrictions on the sale and use of Garlon 4 Ultra specialty herbicide and Accord XRT II apply. Consult the label before purchase or use for full details. Vastlan specialty herbicide is not registered for sale or use in all states. Contact your state pesticide regulatory agency to determine if a product is registered for sale or use in your state. Active ingredients for herbicide products mentioned in this article: Vastlan specialty herbicide (triclopyr-amine), Garlon 4 Ultra (triclopyr-ester), and Accord XRT II (glyphosate).